United Bus Sales is proud to offer you Starcraft School Buses. They focus on safety, performance, and durability! 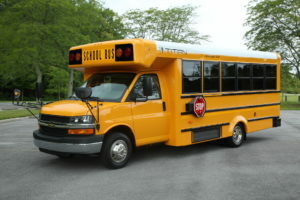 Starcraft school buses, America’s fastest growing school bus company, provides affordable transportation solutions ranging from; school buses, school activity buses, daycare buses, church buses and many other public and private transportation organizations. Safety is the primary focus and the Quest model below is just one of the four models Starcraft builds for the school bus market. The Quest DRW Transit offers the safety of welded steel cage construction with the longest list of standard features in the industry. Other safety-first features include exceptional visibility, standard composite stop arm with incandescent flashing light and high intensity prismatic grade decal, standard 7” round LED stop/tail/turn with 4” LED back up lights. Highlighted features that are standard like our one-piece roof, standard 45,000 BTU rear passenger area air conditioning, drivers switch panel conveniently located within drivers reach, printed circuit board with led diagnostic lights for east of troubleshooting. United Bus Sales is proud to offer you Titan School Buses! Titan Bus is a new entry into the type A school bus market. Though the company and products are new, the people behind Titan are not. With over 100 years of manufacturing and school bus industry experience, Titan Bus will provide outstanding products, customer service and superior quality. Titan strives to be a company that is easy to work with for both our dealers and the end user. With vehicles ranging from 9 to 35 passenger capacities, Titan Bus provides transportation solutions for a variety of end-users from public schools and private contractors to community groups/organizations and child care centers. Incorporating the latest technology, Titan Bus is a true industry leader in the Type A School Bus market. 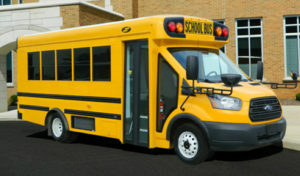 Titan Bus Dual Rear Wheel (DRW) model bus as shown below is a new standard in the Type A school bus market. Designed with 92 inches of interior width which allows for a 14-inch aisle with standard 39” seats offers more room for children and adults to navigate the aisle. An all Galvanized steel cage construction provides all its occupants a safe secure ride. Our state of the art electrical system takes the old model rocker switches and replaces it with a modern touch screen and advanced electrical control nodes. The flexibility that the electrical system provides allows many options to be added without making huge additional changes to the package. © 2019 United Sales Inc.